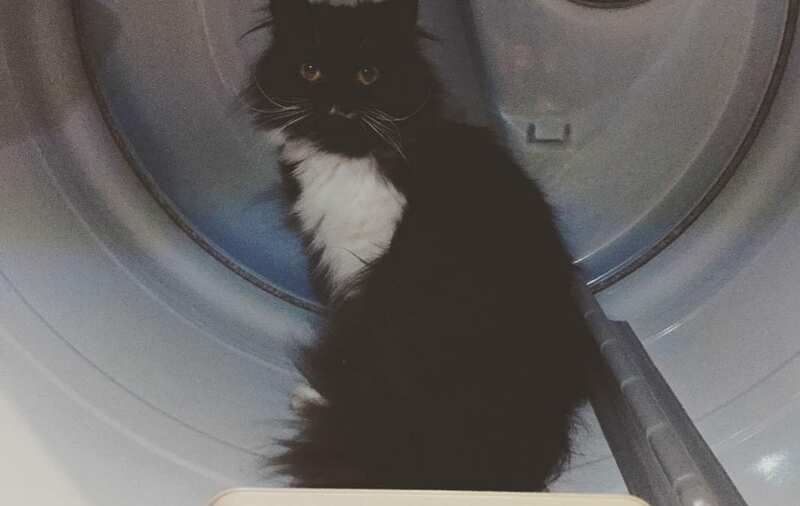 This beautiful girl christened by her family as Hedwig is enjoying the warmth of the family’s clothes dryer. The reality, however, is that Hedwig is sitting is a very dangerous place. Fortunately for Hedwig, her family is familiar with her hiding place, her owners check both washer/dryer each time before starting their machines. Cats and kittens are naturally drawn to front end washers and dryers. Front-end loaders with their doors left open pose a huge risk for our furry friends. The warmth of the dryer is inviting, while the washer itself serves as a wonderful hiding hole. Unfortunately, we have received four calls this year alone from grieving cat owners who lost their beloved feline babies to these tragic accidents. Please, don’t feel like this couldn’t or wouldn’t happen to you. In an instant your beloved cat can jump into a dryer and cuddle into the back of laundry making her or him nearly impossible to see while your standing at the front of your machine. Take the extra minute to check your laundry machines before starting them. PetMD shares just how common these occurrences are. Have a Catnipkind of day!